Who’s ready to trade comdolls today? I hope you are, because I’ve got hot forex trend opportunities on USD/CAD and NZD/USD that you won’t want to miss! First up is a lil’ somethin’ for the dollar bears out there. USD/CAD has just bounced from the 1.2800 psychological handle, which is also right smack at a falling channel resistance on the 1-hour time frame. 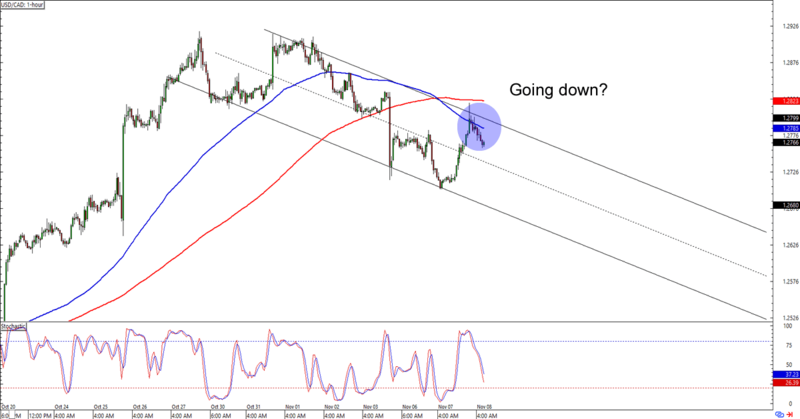 Will the bounce mark a downtrend continuation for USD/CAD? Notice that the 100 SMA has just crossed below the 200 SMA, which usually heralds a trend change. Selling at current levels could still get you decent pips especially if you place your stops just above the channel and aim for the 1.2600 previous support area. But if you think that stochastic will soon hit oversold levels and USD/CAD will encounter support around 1.2700, then you could also wait for a retest of this week’s highs or a break below said mid-channel support area before putting on your short orders. Whichever strategy you choose, make sure you practice good risk management techniques when you execute your trades, aight? Here’s another one for y’all comdoll bulls out there! Much like in the setup above, NZD/USD is encountering channel support after bouncing from the .6900 major psychological handle. 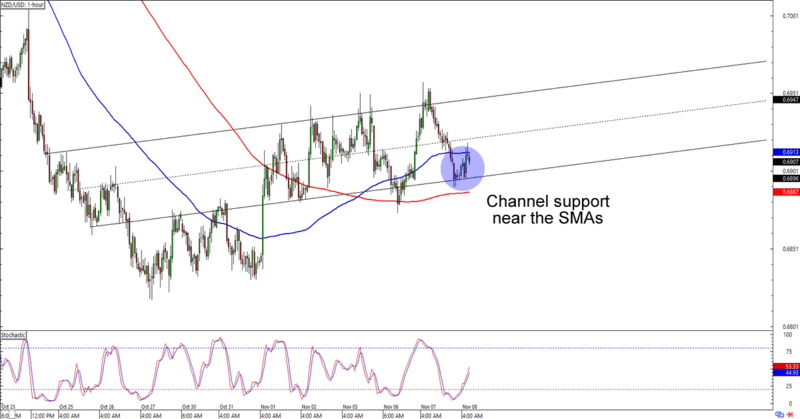 What’s more, it’s also being supported by the SMAs after showing us an SMA crossover. Stochastic has just left oversold territory, so you could still catch some of the uptrend action. A stop just below the channel and a target around the pair’s .6950 previous highs could still get you a pretty good reward-to-risk ratio. If you’re not feelin’ the love for Kiwi, though, then you could also wait for a break below the short-term channel and trade a downside breakout instead. The .6825 area looks neat for a target with the hypothetically broken channel support as resistance.